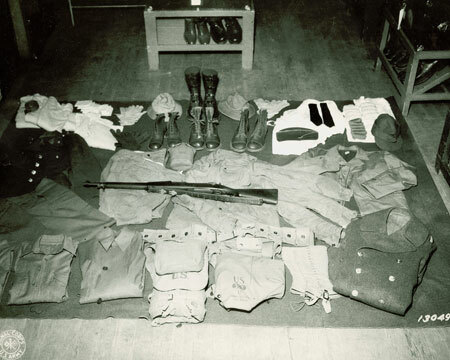 The World War II Core Area exhibit on the Army Heritage Trail is based on technical manuals and photographs from 1944 and 1945 in the USAHEC collections and is a condensed representation of an induction center. 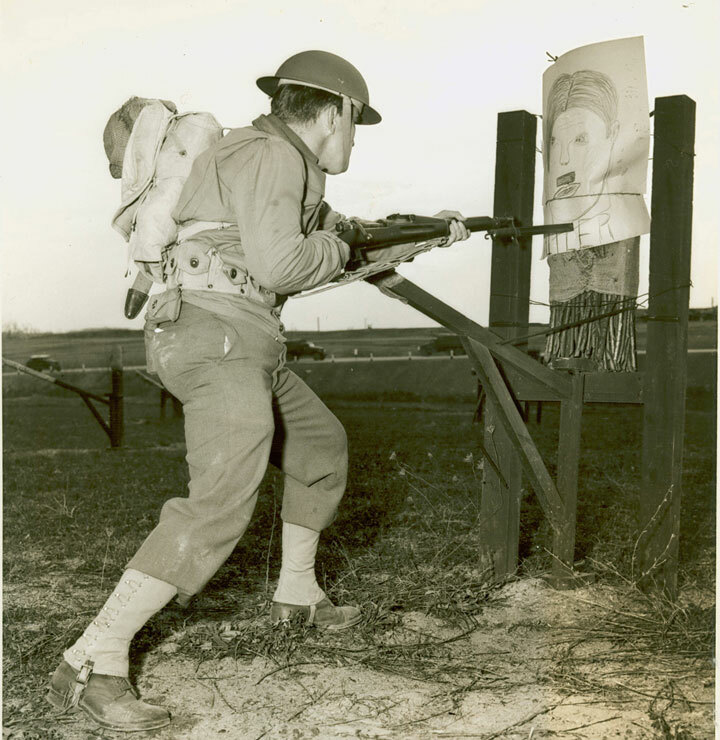 At the outset of World War II, the United States Army was short of properly trained and prepared Soldiers, especially if the U.S. was forced to be into the battles already raging in Europe and Asia. To answer the call for more combat troopers, the Army built induction centers all over the country. The induction centers' design quickly and efficiently in-processed new draftees and recruits into the U.S. Army and shipped them off to basic training. 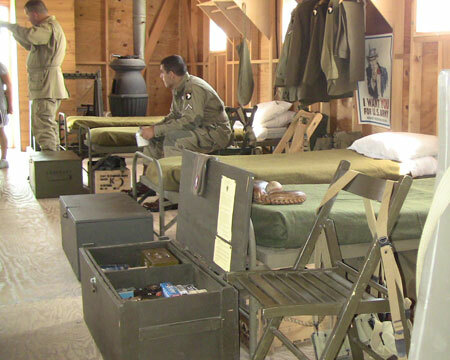 The Barracks building includes period cots outfitted with Army blankets and other gear. The Mess Hall represents the areas of a training center not associated with training, but rather with the Soldier's well-being. Finally, the Company Headquarters building has a model of an orderly room and a classroom with training posters. The United States Army downsized after World War I due to isolationist politics sweeping America. The effect of the war's bloodshed and horror, combined with the post-war treaties, directly led to the Second World War only a few years later. As the Allies fought Hitler and the Japanese invaded China, the U.S. slowly but surely built up its armed forces. The attack on Pearl Harbor and Germany's declaration of war on the United States precipitated America's entrance into a two-front fight, and the Army suddenly needed many Soldiers quickly. To answer the call for troops at the beginning of the war and then to replace losses on the front lines as the war continued, the government instituted a draft. New recruits and draftees had to be inducted into the Army, trained, and shipped to war as quickly and efficiently as possible. 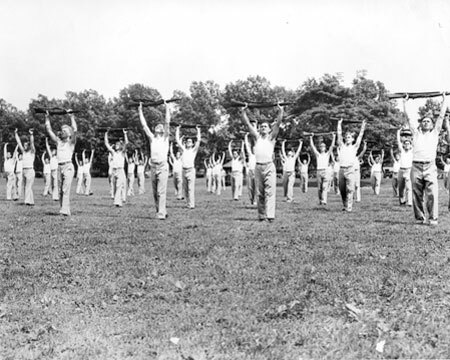 To help accomplish the task, the Army built dozens of induction centers all over the United States. Induction centers had several functions. First, they served as a central location for recruits from all over the country and from all walks of life to gather and be formed into units. 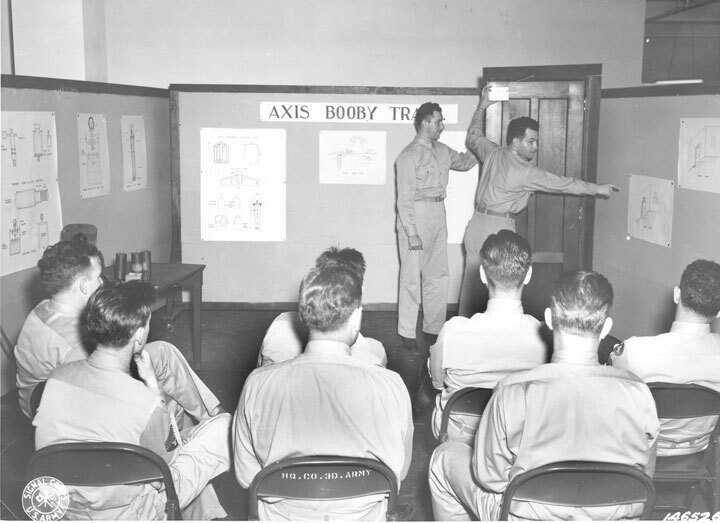 Second, the induction centers allowed the Army to poke, prod, examine, and otherwise check the recruits to make sure they qualified for the rigors of training and combat. Finally, the centers allowed the Army to give the new Soldiers a chance to get a taste of Army life. Fresh recruits shipped out to the centers with nothing but a few personal belongings and soon found themselves marching, dressing, and even eating like a Soldier. The induction centers themselves represented a significant accomplishment of planning and engineering. 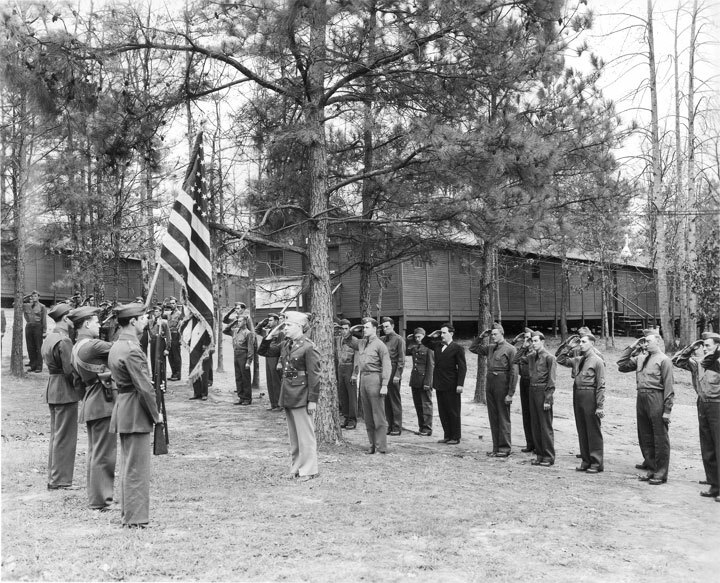 The Army used empty land in strategic locations all over the country to erect, in some cases in only a few short weeks, training facilities built of plywood, tar paper, and clap boards. Mess halls, vehicle garages, and barracks sprang up from nowhere, ready to accept the recruits and turn them into Soldiers The rudimentary buildings, built in a "modular" design, could be used for any purpose from sleeping quarters to training rooms. In addition, the simple constructions were broken down easily and could be shipped anywhere, even to the United Kingdom or islands in the Pacific. A typical inductee into the Army arrived at the induction center via train or bus, and was immediately hurried into a line. Over the first days the recruit's hair was cut very short, he was issued several duffle bags worth of equipment, and sent through seemingly unending medical examinations. Finally, the Soldier was able to retire to the barracks, his new home for the coming weeks. The barracks was the center of the new Soldier's life. 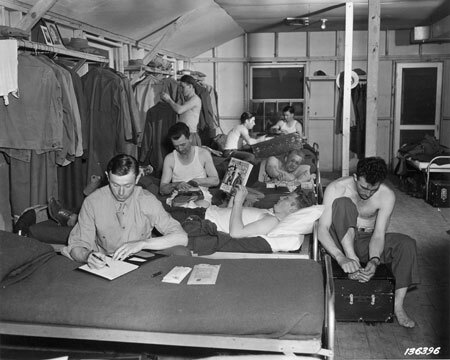 A Soldier had almost no personal space: only a bunk, a foot locker, and maybe a shelf for a few photographs. The arrangement was not only to save space; it was also a tactic used by the Army to train the Soldier. By crowding the troopers into close quarters with their fellows, the Army forced the men to form the tight bonds essential to the effectiveness of a combat unit. At the end of the day, the Soldier could stretch out on his bunk and write a letter home, shine his boots, or play a game of cards. In the morning, however, he found himself standing ram-rod straight at attention, waiting for the Drill Sergeant to inspect his gear. Any "gig" in his gear might earn him an assignment to "K.P." duty! "K.P." or Kitchen Patrol was one of the most loathed parts of being a new recruit. Unlike the contracted mess halls of current 21st Century military operations, Soldiers specially trained as cooks prepared the meals for the new recruits. Unfortunately for the inductees, there were never enough cooks for all of the work needed to feed thousands of troopers a day. At one time or another, every Soldier found himself on K.P. peeling onions and potatoes, scouring greasy pots and pans, or guarding the garbage cans to make sure his fellow recruits ate all of their food. The mess hall was possibly even more important to the Soldiers than their barracks. 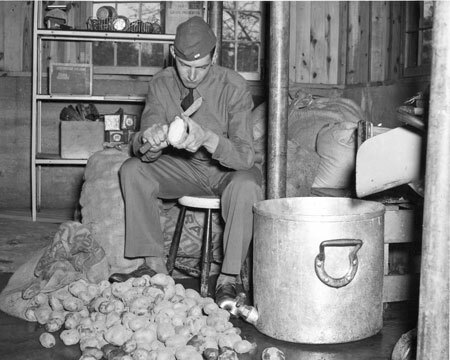 Many of the new Soldiers came to the Army after experiencing poverty during the Great Depression, so quality food three times a day was a major perk. When the troops could not make it back to the mess hall during training, they got their first taste of the new rations the Army issued, K Rations and C Rations. 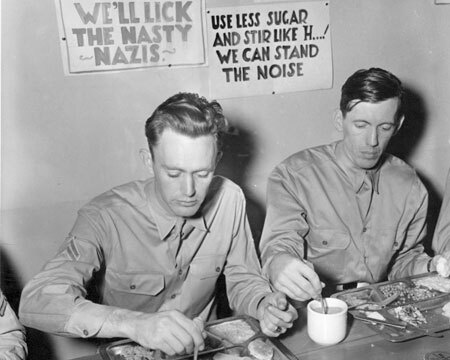 After eating the canned meat and other food items from such rations, most Soldiers happily returned to the mess hall. In addition to barracks and dining facilities, new recruits became familiar with the command post, or CP, and the training room. At the command post, considerable paperwork was completed for each and every Soldier. In-processing papers, furlough and leave requests, and medical record reviews had to be filled out and filed away. The training room served an important role as well. Not all soldiering was learned on the training fields and weapons ranges. Many of the skills the troopers relied on in Europe and the Pacific had to be taught in theory before they could be taught in practice. The new recruits learned everything from how to disassemble, clean, and reassemble their new rifles to how to react to ambushes and booby traps. The new troops quickly found themselves integrated into the United State's rapidly growing armed forces. The induction center was only the first step in their training, however. Soldiers who needed training to perform specialized jobs, such as mechanics or radio operators, shipped off to special schools to learn their new trade. 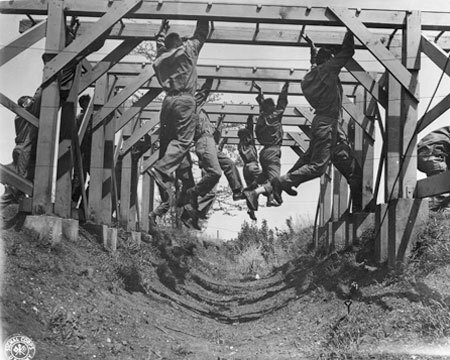 Soldiers serving as infantry, paratroopers, or artillery went to basic training to learn to be a Soldier in their specific branch. No matter where the recruits ended up, they always remembered the shock of their first days at the induction center. Colors are presented as the new recruits learn to salute.